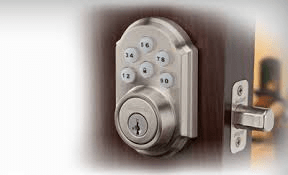 Most smart locks are installed on mechanical locks such as deadbolts. They typically upgrade the ordinary lock. Recently, there have been a number of smart locks that have appeared on the market that provide the convenience of being able to lock and unlock your door from anywhere, or passing on to people you trust a passcode to open the door. Smart locks, like the traditional locks, need two main parts to work: the lock and the key. In the case of these electronic locks, the key is a smartphone or a special key fob configured explicitly for this purpose which wirelessly performs the authentication needed to automatically unlock the door. With some smart locks, the physical key may still be used in case the batteries of the lock have run too low. Generally, the smart door locks operate with 4 AA batteries, so no hard wiring is required. Most smart locks will feature access by entering a code, instead of fumbling for keys. It is easy to share access with trusted friends/family. They are battery-operated and so should still accept access codes on the touchscreen during home power outages. They all claim to be easy to install with just a screwdriver (providing holes for the lock are already installed in the door). Smart Lock manufacturers generally have their own app to set up and control the door locks but can often be controlled by other smartphone apps such as Samsung Smartthings or will work with Apple HomeKit, which is software on Apple iOS devices that lets users configure and control smart-home appliances. Some locks you can use hands-free voice control with Amazon Alexa-enabled devices or Google Assistant-enabled devices. This includes verbally locking or checking the status of the front door. This may require the addition of a wifi adaptor for the lock. Smart locks can be used with a smart doorbell to allow the user to see or communicate with someone at a door before unlocking. These are now mainstream products, available in computer and online stores. These types of products can help support independent living for people with disabilities. Below is a range of the newer smart door locks. 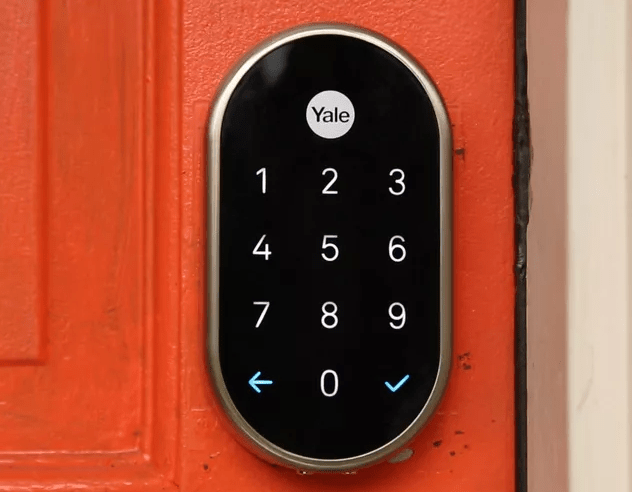 With Yale known for their locks and Nest known for their connected home, they have come together to make a key‑free deadbolt that connects to the Nest app. As with many smart locks you can lock and unlock your door from anywhere or give people you trust a passcode, instead of a key. 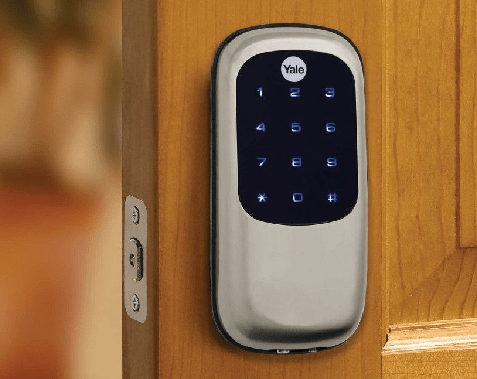 When the Nest/Yale Lock is connected to the Nest app, you can unlock your door from your phone or create passcodes for family and guests. Even set times when passcodes expire. You can get alerts whenever someone unlocks and locks the door. And when Nest knows you’re away, your door can lock automatically. The absence of the cylinder provides a “clean” appearance and means that lock picking will be difficult. It eliminates the need to manage keys for your door. In the event the batteries die – a 9V battery provides enough power to enter the code and gain access to the lock. The touchscreen keypad illuminates for night time access. What makes it different from the other smart locks is that it features a built-in alarm to sense potential door attacks. It works with Apple HomeKit. With the Schlage Sense Wi-Fi Adapter plugged into an outlet within the home and connected to the home Wi-Fi, you can lock/unlock from anywhere using an iPhone or Android smartphone. You can use your lock hands-free, through voice control with Amazon Alexa-enabled devices like Amazon Echo and Dot if you pair your Schlage Sense WiFi Adapter with your Schlage Sense lock. Learn more about Alexa features here and similar to Alexa, you’ll be able to use hands-free voice control with Google Assistant-enabled devices like Google Home. 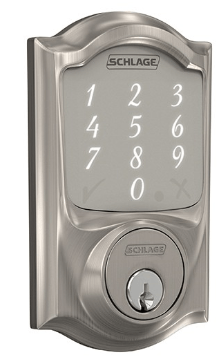 This electronic lock features a battery-operated keypad or touchscreen, eliminating the need for keys. Enter your home with a unique access code or lock your door with the touch of a button. Kwikset’s SmartCode electronic locks offer a touchscreen and touchpad for a keyless entry that fits on any standard door. Z-wave and ZigBee options available. The touchpad with buttons may have the advantage that it consists of raised buttons for someone with a visual impairment. The back-lit keypad provides increased visibility. The SmartCode touchpad smart lock with Home Connect technology enables the lock to wirelessly communicate with other devices in the home. The lock allows the user (through a third-party smart home controller) to remotely check the door lock status, lock or unlock the door and receive notifications via email or text. Kwikset say SmartCode is easy to install, program and use. It operates on 4 AA batteries. It also features SmartKey Security as the back-up keyway. Want to follow by email?